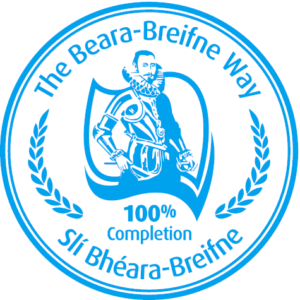 The Beara-Breifne Way is inspired by the legendary 17th Century March of Dónal Cam O’Sullivan Beare, the last great Chieftain of West Cork and South Kerry. Initially hugging the rugged coast of the Beara peninsula, the Way rambles north, crossing the hills into Ireland’s neglected interior, linking bogs, woodlands, riverbanks, rolling farmland and areas of Natural Heritage and Special Protection. The serene landscape of contemporary Ireland is a far cry from that of 1602, when the Munster region was ravaged by war. The forces of Elizabeth I had defeated the Irish and Spanish at the Battle of Kinsale and advanced west to capture O’Sullivan’s lands in Beara. Following a series of battles and the loss of his stronghold at Dunboy, O’Sullivan withdrew with his troops to Coomerkane Valley, west of Glengarriff, on the Beara Peninsula. When the English seized his cattle, O’Sullivan knew his people were faced with almost certain starvation and they had no option but to flee. On New Year’s Eve 1602, he led one thousand men and women, including four hundred soldiers, on the epic march north, hoping to join forces with rebel leaders in Ulster. In the days and nights that followed, they sheltered and ate where they could, but were ambushed time and again by native chieftains, who hoped to protect their stores of food and ingratiate themselves with the English. Many of O’Sullivan’s followers dropped out from weariness and by the time they reached the Shannon, their numbers were severely reduced. Half-starved and hemmed in by enemies, they slaughtered their horses for their meat and crossed the river at night in a boat made of their hides. Two days later, at Aughrim, they were forced into battle by an alliance of Irish and English cavalry and infantry. Though greatly outnumbered and thoroughly exhausted, O’Sullivan and his troops won a resounding victory, and continued on with their march. Many of O’Sullivan’s soldiers were mercenaries from Connaught and they slipped away home as the party passed through the province. The local chieftains continued harassing the rest until at last, after fourteen days and five hundred kilometres, O’Sullivan Beare and his people reached Leitrim Castle, stronghold of the rebel O’Rourke of Breifne. Of the one thousand who had started out, only thirty-five remained. All along the Beara-Breifne Way, there are clan connections to the March of O’Sullivan Beare that remain unbroken to this day and the finer details of the route are supported by folk memory as much as by historical research. However, the highlights of the walk encompass a much broader range of historical, cultural and natural points of interest, from ancient stone circles and places of religious pilgrimage to Big Houses and cottages and War of Independence sites of ambush. The 400th anniversary re-enactment of the March of O’Sullivan Beare led directly to the creation of this official walk in his footsteps. The venture could only have come from the ground up; almost all the land used is in private hands and access has been granted for Beara-Breifne Way walkers. The route may be nationwide, but the sense of ownership and heritage is emphatically local. For the seasoned walker, it is this local interaction that, above all, sets the Beara-Breifne Way apart.